I live in Oregon where it is often rainy at least part of the day during fall, winter, and spring. I need a raincoat, but I don't want to be wearing something totally utilitarian. I would like a stylish, water-resistant coat with a hood. And I'd love for it to cost around $50. Any ideas? 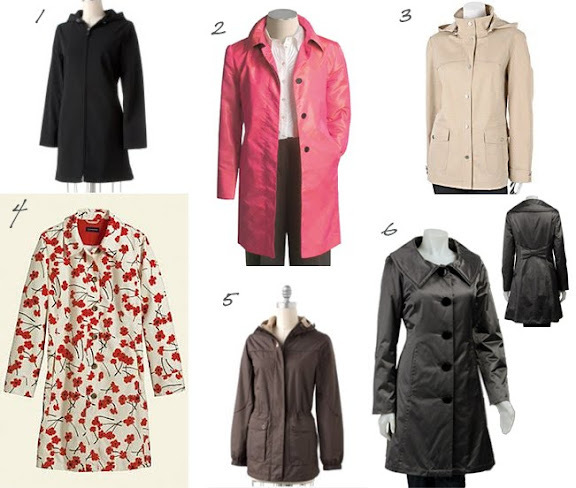 My favorite hooded raincoat is #3, and my fav hoodless jacket is #6. What are your favs? Do you own a raincoat? Does it get a lot of use? Leave a comment! I love #4 -- the pattern is so cute! My raincoat (which I use all the time -- I think it rained for the entire month of October here in NC) is yellow. I like to be sunny when it's cloudy outside. I love #6 too! The back is so wonderful. Thanks, M! I can't believe you and I both picked out #4. It's actually on clearance right now and SUCH a cute pattern. However, I can't justify a raincoat without a hood, since I always have too much stuff (aka kids) to carry an umbrella. So I might try to find something like #3. It's a little more structure, which is cute. Thanks for fulfilling my request! I love the pattern on number 4 as well. I haven't had a raincoat in ages, but just thinking of one makes me feel like a little kid.